Reply, for 'Mrs Fraser'. Cullen received Alves' letter from Gutuley[? ], having answered it by the very first post after. 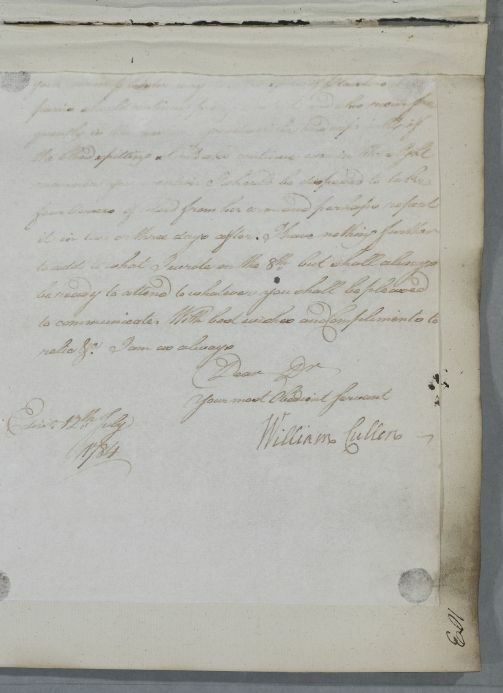 He mentions having in hand a letter from Alves of the 6th, which seems to be missing. Mrs Fraser's symptoms include a spasmodic fit, which appears to Cullen to be 'external and in some measure Rheumatic'. To treat the spasmodic fits, Cullen recommends warm plaisters and a blister, drinking plentifully of arabic emulsion to stave off strangury or irritation of the uterus. If the blood-spitting continues, Mrs Fraser is to be bled. Summary Reply, for 'Mrs Fraser'. Cullen received Alves' letter from Gutuley[? ], having answered it by the very first post after. 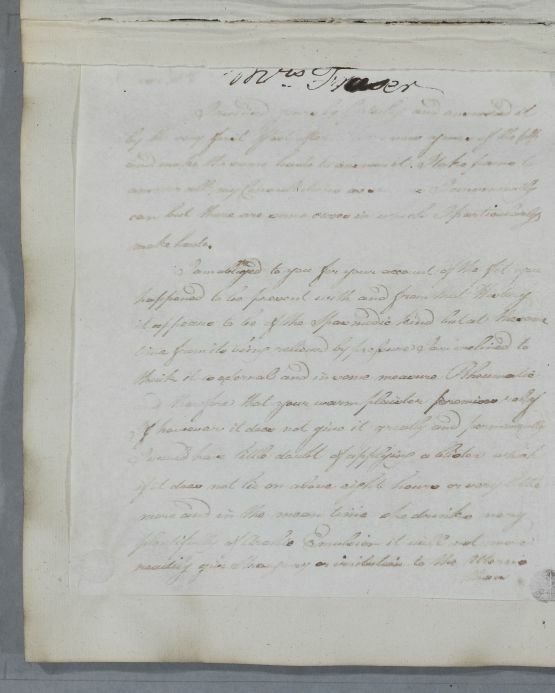 He mentions having in hand a letter from Alves of the 6th, which seems to be missing. Mrs Fraser's symptoms include a spasmodic fit, which appears to Cullen to be 'external and in some measure Rheumatic'. To treat the spasmodic fits, Cullen recommends warm plaisters and a blister, drinking plentifully of arabic emulsion to stave off strangury or irritation of the uterus. If the blood-spitting continues, Mrs Fraser is to be bled.